One of our favorites, Vanessa Kelly returns today to tell us about The Dukes of Vauxhall, an exciting new anthology she co-wrote with three other historical romance authors (I'm reading it now and loving it!). Named by Booklist as one of the"New Stars of Historical Romance," bestselling author Vanessa Kelly's books have been nominated for awards in a number of contests. She is also the recipient of the prestigious Maggie Medallion for historical romance. With a Master's Degree in English Literature, Vanessa is known for developing vibrant Regency settings, appealing characters, and witty storylines that captivate readers. You can visit her on the web at vanessakellyauthor.com, on Facebook, Twitter, Pinterest, Goodreads, and tumblr. Hi PJ! Thanks for hosting me today! It’s always such a pleasure to be with you and your readers. I’m thrilled to be sharing the release of THE DUKES OF VAUXHALL, which I co-write with my fellow lady scribes, Theresa Romain, Christi Caldwell, and Shana Galen. Talk about a powerhouse line-up! I can’t tell you how intimidating fun it was to work with such talented women. But, seriously, we had a great time, especially in coming up with our story world. We wanted to work with a setting that would be exciting, exotic, and even a little bit dangerous. The pleasure gardens of Vauxhall did the trick nicely. Regency readers will likely know a bit about Vauxhall Pleasure Gardens, which were situated on the south bank of the River Thames. Until a bridge was built around 1810, most Londoners had to travel to the gardens by boat. Once disembarked, revelers strolled into a large, wooded park crisscrossed by colonnaded groves and various walkways—including the infamous Dark Walk, scene of many an illicit assignation. There were separate areas of entertainment that included an orchestra pavilion and music room, and exotic structures like the Turkish Tent. And, of course, there were the famous supper boxes ringing the Grove, where visitors could partake of the famous Vauxhall shaved ham and drink wine and punch while watching the crowds parading beneath the colonnades. 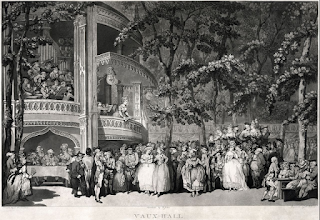 Entertainment abounded at Vauxhall in the form of concerts, dancing, fireworks, masked balls, theatrical spectacles, and even included acrobats and tightrope dancers. In fact, the heroine of Theresa’s story is a Vauxhall tightrope dancer, which is totally cool. THE DUKES OF VAUXHALL also features a thoroughly illegal prizefight on one of those infamous dark walks, which stars the hero of Christi’s exciting novella. Naturally, given that simply everyone went to Vauxhall at one time or another, that meant pickpockets and criminal gangs also roamed wide, lurking in wait for someone silly enough to wander too far from the crowds. You’ll meet some of the more nefarious denizens of Vauxhall in Shana’s adventurous story—along with the mysterious crime lord who uses the unique attributes of the Gardens to pull off a spectacular coup. 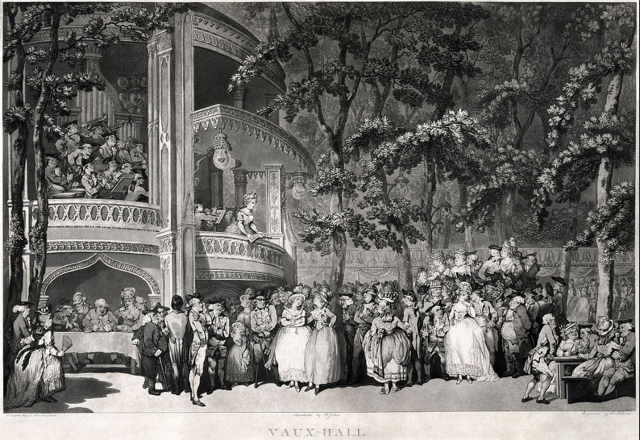 And did I say everyone went to Vauxhall Gardens? Just about, including the members of the Royal Family. The Prince Regent kept his own special supper box, and royal dukes were known to frequent the various entertainments—which is an element in my novella! My hero is the illegitimate son of a prince, and he encounters more than a few adventures (and romance) in those dark walks and secluded grottos. As you can see, Vauxhall was a unique, thrilling, and occasionally dangerous place to search for a good time. Regrettably, the Gardens no longer exist, disappearing under the relentless march of London’s urban development. Fortunately, you can still visit this romantic setting between the pages of THE DUKES OF VAUXHALL! What are some Regency settings you really enjoy? One person who comments will win a digital copy of Christi’s latest book, along with a book each from Vanessa, Shana, and Theresa in either digital or print—reader’s choice! Oh my, this sounds absolutely delicious. Four of my favorite Authors in one book does it for me. It is delicious! I'm on the fourth novella (Vanessa's) and loving all of them. Thank you so much! PJ, it's always a pleasure to be here. So glad you're enjoying the book! I have not yet read this anthology. These wonderful authors are all my favorites of mine so I need to "get busy!" Congratulations to Vanessa, Christi, Theresa, and Shana!! It just released, Connie. Good stories! I enjoy all these authors - this is one of my favorite type of reads. No particular setting but the balls are always interesting to read about. The novellas are all set within Vauxhall but in different venues and with out of the ordinary characters. Fresh, original, and oh so good! I've never read any of these authors save Shana! And I love her stuff and would love to read this one! You're in for some good reading, Linda. They're all terrific! It's always an honor to work with Shana! Thanks so much, Linda! Nice to see you in Milwaukee too! I love all these authors, so will have to get the book. I also don't have any favorite settings, but love balls. It's always fun as a writer to do a scene at a ball! We had a lot of fun doing this project, Janette! I love reading Regency anthologies, so I am excited to hear about this one. Favorite Regency settings? Balls, of course. Also, country house parties. Regency novels are captivating and unforgettable. I enjoy locales in the countryside. I like country settings, too! These authors are so talented. Reading regency stories located in charming towns is special. I can only imagine the panic that set in when mothers let their daughters travel to the gardens! It sure did make the men step up their game with the mothers shackled to their daughters for the whole trip! Patti, our heroines are pretty adept at getting around the restrictions! Readers, if you can't tell, we actually really like each other, which makes doing an anthology like this fun and easy. I agree with some of the other commenters, but really enjoy reading about the ballroom scenes and the goings-on in and around them! Balls are always great for fun and lots of drama! My copy of The Dukes of Vauxhall is on my Kindle, and I look forward to reading it as soon as I get caught up with May reviews. With these authors, I am sure it will be a treat. My Regency addiction, which goes back to the Heyer books of my youth, encompasses an array of settings, but I confess to a particular affection for country house parties. I really can't imagine limiting my reading to any a few settings or time periods. I definitely need to read this anthology! One of my favorite settings in Regency stories, besides the gardens, are visits to Bath. It does sound like a lovely anthology. And the authors are some of my favorites. Thanks for this reminder. I like stories set in country estates. They are a bit more relaxed but the characters may be more exposed to criminal activity in different ways than in the city. There are always possibilities for adventurous experiences. Situations that turn into "road trips" are always enjoyable. I look forward to this anthology. With my crazy schedule, short reads are often a must. Better yet, the four of you are favorite authors. awesome collection of authors! Ummm... I go where the author takes me :) Thanks for sharing! Thanks to everyone who stopped by today and many thanks to Vanessa! A must read anthology for me. 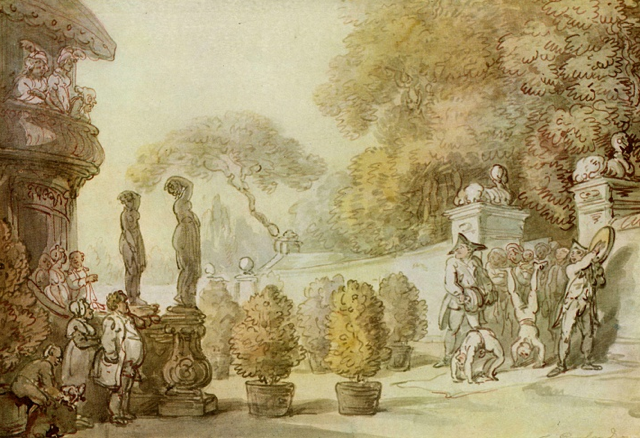 Vauxhall Gardens are always a pleasure to read about. 4 extremely talented authors! I like visiting the men's clubs White's, St George's( Sabrina Jeffries) and the scandalous gaming clubs. I like to visit Hyde Park and Trafalgar Square. Visiting their personal estates is also a treat. This one sounds fabulous! I love a variety of Regency settings from the country house parties that lasts for weeks to the musicales and balls. It just seems like such an interesting era to read about. Thanks for sharing this anthology! I always enjoy a ball with the gowns and the jewels.